In this landmark series, Rose Sweet, renowned author, speaker, and pastoral counselor, tackles the pain and suffering of divorce from her own experience and the perspective of the Catholic Church. Joining Rose in these twelve 30-minute sessions is a distinguished team of priests and professionals, including Fr. Mitch Pacwa, SJ, Dr. Ray Guarendi, Fr. Donald Calloway, MIC, Christopher West, and Fr. Steve Porter, STL, who have dedicated their lives to helping people understand and cope with loss and grief. 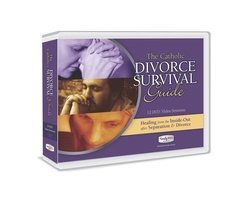 Together with the testimonies of recently divorced people, they will guide you through the upheaval of separation and divorce, and then, through the teachings and Sacraments of the Church, they will help you find the peace, power, and passion you’ve always desired.